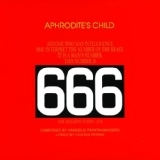 666: Apocalypse of St John..
APHRODITE`S CHILD R&P INTERNACIONAL INTERNATIONAL MUSIC Out of print in the U.S.! Two CD release for this landmark 1971 album by the Greek act led by Vangelis. A concept album about the Bible's Book of Revelations, this edition contains all 24 tracks from the original release. Includes the near-hit 'Break'. Universal.